At first glance St. Louis’ most recent gift to America’s art form pales in stature to what audiences are accustomed to seeing on the bandstand. But open your mind, eyes and ears (not necessarily in that order). At twelve years of age, the diminutive frame of Tito Pascoal will, indeed, surprise you. While he may not have a list of musical accomplishments yet, Tito is equally deserving of the audience’s attention. “What excited me the most is that he didn’t try to over play. That’s a sign of maturity,” said Tom Kennedy. The veteran bassist performs with industry icons Dave Weckl and Bob ‘Yellowjackets’ Mintzer on “Walk the Walk,” Tito’s newly released freshman CD on the TProductions label. It’s obvious from Tito’s vocabulary that he has a lot of influences. “For instance, Jimmy Cobb, Buddy Rich, Art Blakely, Tony Williams and Vinny Colaiuta,” Tito says with excitement. When he performs, you immediately hear the culmination of numerous styles. He swings with the spirit of a seasoned master, but with a fresh, youthful fire. Both his swing and fire add a great deal of power and strength to his playing. With the attack of a 20-30 year old, Tito is one of the most exciting live drum performances to watch anywhere. Even with the drop of a stick at one recent show, this tiny tyke did not miss a beat. Tito dazzles you as he continues to play with a confident groove to the rhythm. Perhaps it comes as no surprise that while the little drummer boy is dwarfed by the size of his drum kit, he is a giant talent. Already quite accomplished for one so young, Tito has inked his first professional endorsement with Vic Firth Drumsticks. He is establishing a strong fan base of his own on MySpace, has performed as a headliner at Clayton’s posh club, Finale Music + Dining and plans a two week European tour this spring. “Kids like him are the future of what we do,” said Tom Kennedy. Tito achieves a musical maturity beyond his years with a talent fueled by inner drive and opportunity. 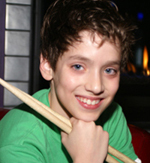 Perhaps that is why he has captured the attention of his peers and adults twice his age on the national music scene. To hear Tito Pascoal, you can listen to sound samples from “Walk the Walk” at: cdbaby.com or myspace.com/titopascoalband. This article was first published in St. Louis Sound magazine. Copyright 2007 © Dawn DeBlaze.